When looking back, huge steps have been taken since last summer when the first words of Nokian Neulomo story were written. It all started with a half-crazy idea and evolved into a surprising success story no one expected. The year has been fast but most of all rewarding. There’s been ups and downs, surely, but isn’t that all part of this rollercoaster called life? 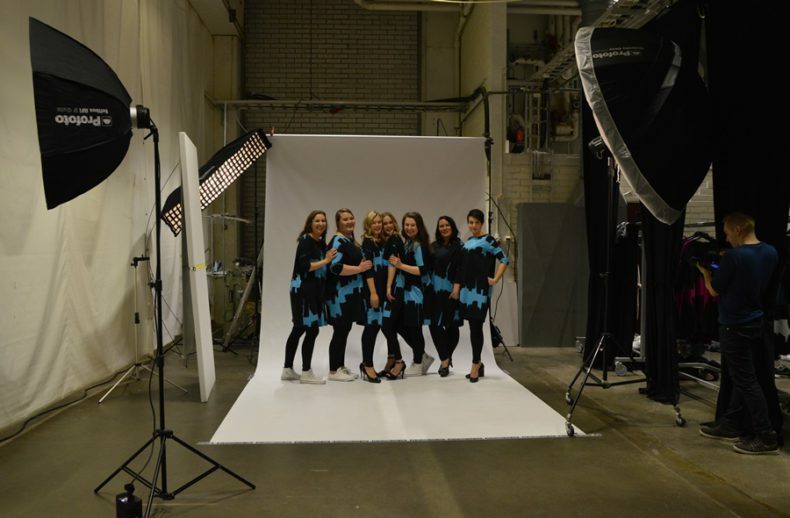 Elina, Silke, Päivi, Linda, Lotta, Susanna, Anna at the photo shoot. Photo by Laura Tähkävuori. Our first pre-sale was a huge success – surprisingly we had so many orders that it led to delivery problems. It was more than expected, and we’ve surely learned from it! In a way, though, such an amount of orders can be seen as a positive problem: the success of the pre-sale proved that we are on the right track. 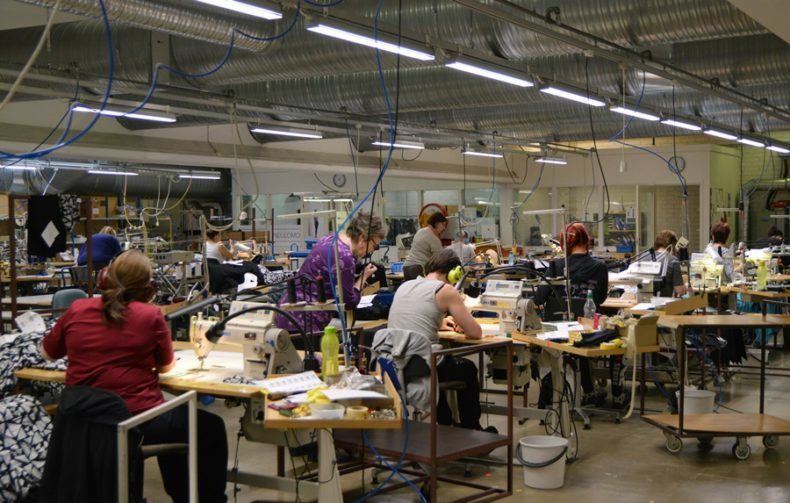 Finns want to wear clothes that are produced near and in safe conditions. During winter, we were desperately looking for professional sewers, but finding the right people is not as easy as we first imagined. Since last fall we’ve hired nearly twenty sewers but we still definitely need more extra hands! This is where the magic happens! The sewers of Neulomo. Photo by Laura Tähkävuori. Matti makes the steam machine work. Photo by Laura Tähkävuori. CSO Marika Snellman and web shop/marketing specialist Heli Harlin making plans for a charity fashion show. Our new collection behind the two. ‘’To every woman in every size” has been our way of thinking since day one. Our collections and clothes are inspired by the people who wear them. By asking, and most importantly listening, what people have to say, we’ve gained a lot of information we wouldn’t have otherwise gotten. Social media is a great tool for interacting with consumers because it makes you face up your weaknesses and react quickly. Fortunately, our customers have also been extremely active in giving feedback and telling their wishes and thoughts on the products. If something doesn’t work, we’ll fix it. Last fall, for example, people were asking for more colours, so now we are launching our first spring collection with the colours they asked for. 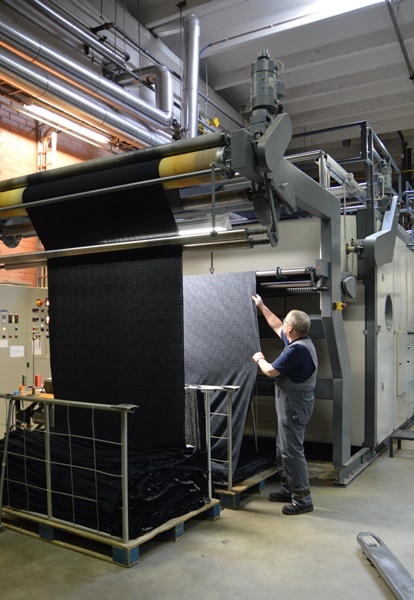 Also, by asking and by pre-sales we can prevent producing extra fabric kilos to the warehouse. Though we are very excited about our SS17-collection, it’s not only Neulomo-trademark that we do. After buying the factory, we’ve been able to help other companies to bring their production back to Finland too. Collaborating widely with other Finnish brands, such as Papu and Uhana Design, is definitely one of the cornerstones of our business. All in all, people have been incredibly welcoming to our company and the products. We ask, and we do. That’s not always the easiest nor the cheapest way of producing, but it surely is the way to create products Finns actually want to wear. The photo shoot of our SS17 collection. Behind the camera Mikko Ovaska and the beautiful models Minna, Anna-Maija and Elina. Photo by Laura Tähkävuori.